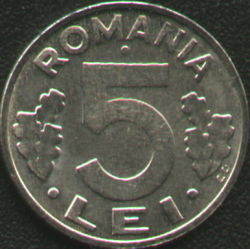 ROMANIA, denomination "5 · LEI ·", a pearl above 5 and three oak leaves at left and at right. Along the rim at four o'clock lies C.D. standing for Constantin Dumitrescu, the engraver's name. 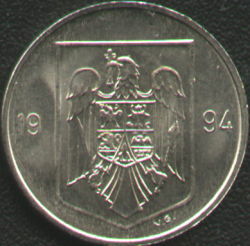 year 1994 and Romanian coat of arms. Along the rim at five o'clock lies V.G. standing for Vasile Gabor, the engraver's name. This coin was issued on 21st of December 1992. The information concerning the estimated mintage figures for the coins struck after 1989 is given after "Standard Catalog of World Coins", editor G. Cuhaj. The 5 lei coin was not struck in 1996; even if we have in our possession coins of 1 leu, 20, 50 and 100 lei struck then same year. Below there are the pictures of a die essay for the 5 lei of 1993. The essay is struck in a copper-base alloy and was not cut, showing in an octagonal shape. 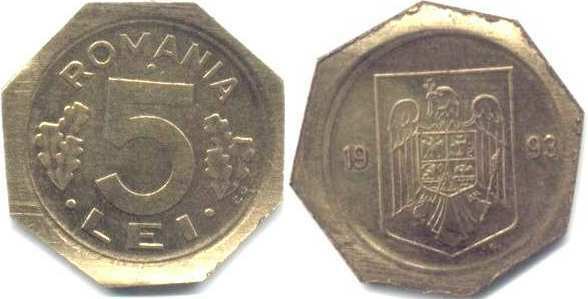 On Romanian Coins you can also see several patterns for 5 lei from 1991. The essay images above are present on Romanian coins as courtesy of Mr Adrian Popovici.